NEWPORT BEACH — The fuel dock at Newport Landing — at 503 E. Edgewater — has reopened under new ownership, offering another fueling option for boaters in Newport Harbor. PetroSea Fuel opened Sept. 20, and new owner John Balian wants to get the word out to boaters that the fuel dock is once again ready to serve their needs. Balian, a Seal Beach native, grew up in the gas station business with his father, and he currently owns a land-based service station in Huntington Beach. When he saw the opportunity to take on the Newport Landing fuel dock, he decided to take it. Both diesel fuel and premium unleaded gasoline is offered at PetroSea, with the diesel including the fuel additive Viscon, the only fuel blending component verified by the California Air Resources Board as a diesel emission control strategy to lessen emissions and to reduce the carbon footprint caused by diesel engines, Balian said. 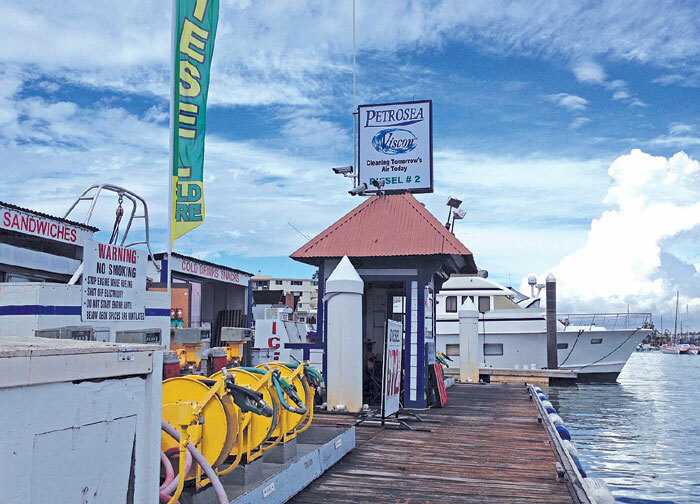 According to Balian, boaters can expect to find the lowest-priced fuel in the harbor at PetroSea, along with a variety of snacks, ice, sodas, frozen bait and — coming soon — beer and wine. The fuel dock will be open from 7 a.m. to 7 p.m. daily, located at Newport Landing. Daily prices can be checked by calling (949) 675-2972.